This article appeared in the October 2013 Rural Policy Matters. For Jenna Hunter it was watching the rapid decline of family farming in her rural North Carolina community and wanting to find ways that her students could help protect their land and still earn a living. For Pam Dow and Meg Allison it was gaining a new appreciation for the importance of storytelling after floods devastated their small Vermont town. For Selena Montgomery it was concern about the health of local children and a desire to do more to meet the growing diversity in her south Georgia community. Nicole Buschmann and Maribeth Dann wanted to stretch themselves well beyond their usual comfort zones—and gain an understanding of how the ecosystems in their rural Missouri farming town connect to those on the other side of the world. The 32 rural teachers who traveled the globe as 2013 Global Teacher Fellows each had their own reasons for making a journey to another part of the world. But they all came back with renewed enthusiasm, fresh perspective, an expanded appreciation for their own place, and deeper faith in the capabilities of their students to make their own communities—and the world—better for everyone. 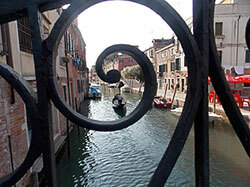 You can read descriptions of each of the 2013 Global Fellows and their travels here. As in previous years, Fellows underscored the importance of being trusted to create their own challenging learning experience. They reveled in a sense of discovery and freedom, experienced unexpected insight, and found new wells of inspiration for teaching. And they all expressed a deep gratitude for a life-changing opportunity. In this issue of RPM we’ll hear from several Fellows about their experiences, with an emphasis on some of the thought-provoking ideas their travels inspired. 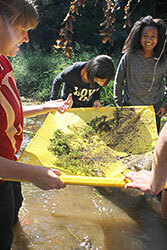 Orange County High students studying their local environment. Back in North Carolina, teams of students in Hunter’s Advanced Placement Environmental Sciences classes are working directly with a local farmer to consider potential conservation uses of his family’s farm. “Students can come up with their own ideas for what they think fits our community,” she says. Jennice Wright teaches sixth, seventh, and eighth grade social studies at Auxvasse Elementary School in central Missouri, where the curriculum emphasizes civic skills and global competencies. “I’ve always been interested in democratic change and democratic movements,” she explains. 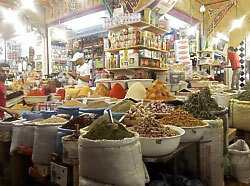 The opportunity to travel to Morocco, an Arab Spring country where democratic reforms are being implemented successfully and peacefully, was just what Wright was looking for. “So much of what students and their families see in the media highlights the failures of democracy and democratic movements and gives the impression that those countries are full of scary people who hate democracy and other religions. It is important for them to see a success story, one that helps demystify that part of the world,” she says. 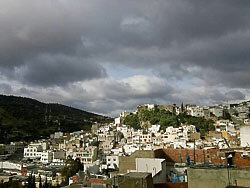 Wright chose to spend most of her time in the small town of Moulay Idriss, where she stayed in a guesthouse and with a local teacher. By remaining in one place she says she was able to fall into the pattern of daily life. "People invited me into their homes and worked hard to make my trip special. Even before I arrived, people were calling the guesthouse to see if I needed anything. They were helping me build my global network even before they met me,” she says. Almost everyday, Wright posted photos of her daily experience on Facebook: the people she met, children playing, the markets, and the landscape in the foothills of the Atlas Mountains. She also sent postcards home to her students in Auxvasse. “People were very taken with the architecture and the beauty. In the photos they could see me in another place surrounded by warm friendly people who cared about me and my experiences. What had been concern about my safety began to turn into excitement about what I would be doing next,” observes Wright. So when the two decided to apply to be Global Fellows, it felt completely natural to go to the heart of the European fairy tale. “Fairy tales speak to universal themes. They are quests for identity, or a new world is revealed,” says Allison. Many people assumed they would go to Germany. 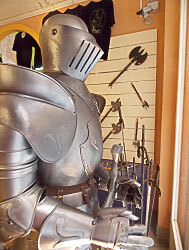 “But Charles Perrault was writing down folk tales in Paris 200 years before the Grimm Brothers,” says Dow. Many of the older fairy tales like Sleeping Beauty and Rapunzel originated in the mountains of what are now France and Italy. And, many were based on real people. “There are strong female role models behind many of these tales. That helps bring them to life for our students,” Dow adds. Moretown students will be asking what’s behind those local portals as part of a community history project. And they will be writing their own fairy tales inspired by their own environment. “It will be fun to see what characteristics they give their heroes and heroines,” says Dow. Allison and Dow found more connections between their community and some of the places they visited. Recent flooding in Tuscany and rising sea levels in Venice are probably related to the same climate issues that made Irene so devastating in New England. “We really are all connected,” Allison observes. 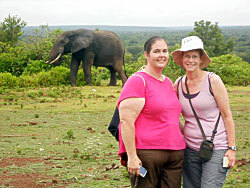 Maribeth Dann and Nicole Buschmann experienced similar insights about connectedness and community in their trip to Ghana. The pair teach middle grades gifted and reading classes and high school/dual credit biology and anatomy, respectively, at Hermann High School in Missouri. They traveled deep into rural Ghana, backpacking, taking canoe trips, and riding in local tro tros (small vans) and buses. “We wanted to experience different ecosystems,” says Dann describing their travels on the Volta River, in the savannah, along the coast in rainforest and wetlands, and a visit to Ghana’s highest mountain. In addition to hippos, they saw baboons, elephants, water buffalo, antelope, and monkeys. They were warmly received in villages and at a rural elementary school, and they immersed themselves in one of Africa’s largest open-air markets, where 10,000 vendors sold everything imaginable, including pottery, beading, basketry, and batik. Dann and Buschmann have transformed their experiences back to their students in Hermann by having students observe, measure, study, discover, and document their own local environment. “The students are much more engaged,” says Buschmann. Students are also testing the health of fish and doing timber surveys and soil samples with local landowners. For all the excitement of their travels, Dann and Bauschmann both say the most memorable event of their trip happened early in their time in Ghana. A young Hermann High graduate working in Ghana was with them in Accra, the capital city. They needed to get to the bus station, but weren’t sure where it was. So their former student asked a young man on the street for directions. Many students at North Wilkesboro School in North Carolina, where Lynn Barber teaches kindergarten, are learning English. 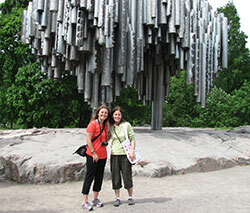 Barber and her daughter Kristi Day, who teaches first grade at Traphill Elementary (also in Wilkes County), traveled to Finland. Finnish students, including recent immigrants just learning the language, are among the highest-scoring students on international assessments. 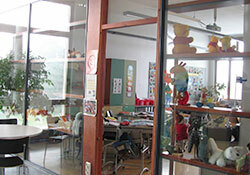 Barber and Day wanted to learn what Finnish schools are doing to achieve such success. 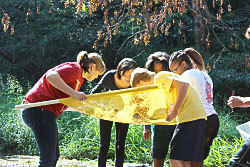 Academic classes in elementary school are hands-on, community-oriented, and last only a few hours. The rest of the day teachers collaborate while students are involved in arts activities and athletics. 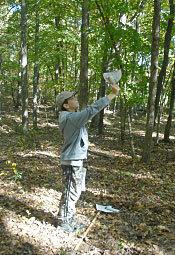 These students do many of activities that other students do, creating a leaf collection, for example. In the process, they are learning how to learn, building friendships, experiencing what is expected of them in school—and learning Finnish. Selena Montgomery and colleague Delceina Layne felt so welcomed in the Vermont schools they visited en route to Canada that they returned to Vermont on their way home. “They chose their destinations for some of the same reasons that Barber and Day were interested in Finland. Montgomery and Layne teach at North Mitchell Elementary in southwest Georgia. Diversity in their school has increased dramatically in recent years, primarily as families from Mexico and Central America have moved to the community for jobs in the agricultural sector. Montgomery and Layne wanted to learn from schools successfully meeting diversity and teaching language. So they headed to Montreal, Canada where schools have a history of working with diverse populations and to Burlington, Vermont, where the Vermont Refugee Resettlement Program is located. Montgomery and Layne had another goal as well. North Mitchell Elementary has recently started a school garden with an emphasis on healthy living. As fourth and fifth grade teachers, the pair wanted to learn from schools successfully integrating gardening, foods, nutrition, and health into their curriculum. “When you have rural kids coming in at five or six with high blood pressure, diabetes, buying adult clothes and cutting off the legs, you have ask: How did we get here?” says Montgomery. While she and Layne enjoyed and learned during their time in Canada, it was the nine Vermont schools they visited that captivated their imaginations. “It’s just beautiful how they embrace the different nationalities of their students,” Montgomery says. “When you walk into the school, you see an artwork depicting each of the home countries of all the students,” she says. Sometimes the art—stained glass collages, quilts, bottle cap sculptures—was created by students and sometimes by local artists working in the school. The school cafeterias were true social and learning hubs. Flags from each nation hung from the ceiling. “The cafeteria had two lines, one with American cuisine and one with international foods; students could choose whatever they wanted that day,” Montgomery explains. The cafeterias also held food-tasting events and conducted surveys of student preferences. “The students have a real sense of ownership and feeling that their backgrounds and cultures matter,” says Montgomery. In addition, most of the foods served were grown in the school garden or purchased from local farmers and made fresh in the school cafeteria. 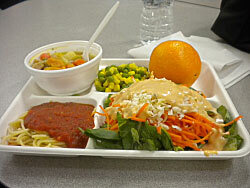 The schools also hosted harvest suppers serving vegetables and other dishes, many of which were provided by families. They sent food home with parents and ran community Meals-On-Wheels programs out of the school cafeterias. 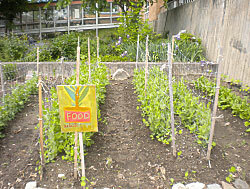 The school gardens and greenhouses are integrated in the schools’ curricula and students do much of the work. The curricula, in turn, is integrated with the community—academically, socially, and culturally—so parents and community are very immersed in the life of the school, often volunteering hours of time every week. North Mitchell Elementary wants to cultivate a sense of family for all their students. “We want our students to be able to say: ‘I’m from Mexico, and this is my family, too,” says Montgomery. A big part of that effort will be cultivating their garden and their community connections. “Sitting down together and having a good meal and conversation, that’s really it,” says Montgomery. The Rural Trust Global Teacher Fellowship program awards up to 25 fellowships a year to support the professional and personal development of rural teachers. The awards (up to $5,000 for individual teachers and $10,000 for a team of two or more teachers) support teachers’ participation in self-designed summer learning experiences and a two-day place-based learning institute in the fall. Teachers are encouraged to center their learning in an international travel and study experience, out of which they develop interdisciplinary, place-based learning curricula aligned with their specific state and local content standards. Application deadline for 2014 Global Teacher Fellows is January 30, 2014. Learn how to apply here: www.globalteacherfellowship.ruraledu.org/apply.html. Read more from the October 2013 Rural Policy Matters.